Time for a new laptop? Deals starting at $399.99 including free data transfer. Is your computer ready for Windows 7? Check the 'Free Software Downloads' section to find out. Upgrade options starting at $119.99 for Windows 7. Computer slowing down? We can speed it up with a cleanup and a memory upgrade. Ready for a new computer? Deals starting at $549.99. Stop by today! Want internet? 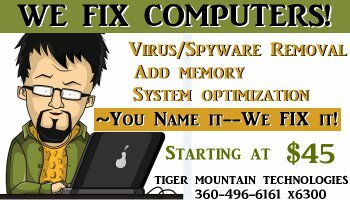 We have high speed wireless, DSL and dialup.Call us or stop by our downtown Morton, WA location. 360-496-6161 or 360-985-0240. Thanks for shopping locally. We appreciate your business. Serving you since 1996.